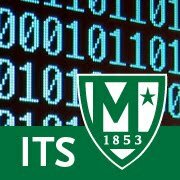 ITS will be performing necessary computer lab maintenance this week. Maintenance will occur Wednesday and Thursday evening from 9:30PM - 7:30AM and Friday evening from 5:00PM - 3:00AM. During this time, the computer labs being imaged would not be accessible and the network in the library will be noticeably slower than normal. We will put a notice on the door of the computer lab being imaged to notify users that it is not accessible.